Present your home to sell is the third of the “3-Ps” to selling your Seattle area home quickly and at the highest possible price. The first P is Pricing, and the second P is Preparation. 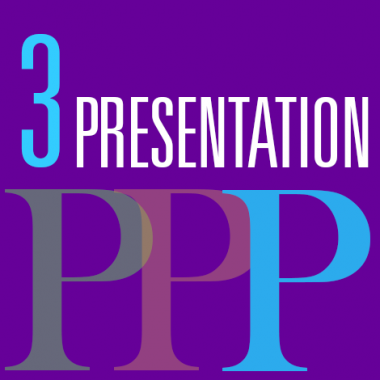 My 3-P system is a proven method of listing and selling your home in any market. Even in a sellers’ market, the 3-P system produces superior results in terms of days-on-market and sales price. This is when you reap the benefits of your good work. 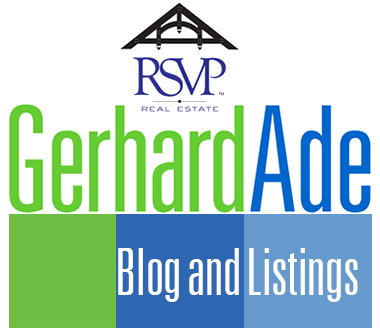 We know what it takes to sell your Seattle home in the prevailing market conditions, and we’ve kept tabs on our competition. You’ve made repairs and improvements. Your home looks good inside and out. Now we get to show off the place. When you present your home to sell, a good listing agent makes all the difference. 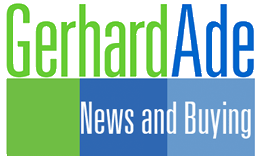 Homes are sold through two channels – the agent-broker channel and the public channel. The first is known and narrow; that’s the MLS. The second is vast and varied; that’s the Internet. In practice, everything starts with the listing on the MLS. It triggers the export of the data and description to MLS member Web sites and countless real estate portals. The successful home sale at the highest possible price in the fastest time depends on exposing your home in both channels to the maximum potential. To present your home to sell, we take six actions. Create a list of facts and features. One item in the preparation phase was taking inventory of your home’s history and condition. The other was a list of repairs and improvements. While you present your home to sell I create a list of everything I know about your home. That starts with the obvious, such as the square footage and the fully-fenced yard and includes minutiae such as the most recent date when your furnace was checked. The purpose of this list of facts and features is twofold. One, it serves as the source for every fact stated about your home. Two, it serves to answer every possible question anyone may ask. The saying that a picture is worth a thousand words also applies to bad pictures. It’s all about first impressions. Unless your listing agent is skilled at taking pictures, using a professional photographer is a must. The listing agent should make sure that the pictures capture the character of your home. The sequence in which they are shown should be like a visual walk-through of your home. Avoid extreme wide angle shots. They raise expectations that lead to disappointments once the buyer comes to visit. Virtual tour “videos” that are mere pans across still pictures don’t impress today’s YouTube watchers. A video should do what still photography can’t. Because the listing input data will be exported across the Internet, it must be correct and complete. Only about 85 words can be used for the marketing remarks to sell your Seattle home. Still, the remarks should be written for the Internet marketing channel where they will be seen by many more potential buyers than by agents on the MLS. Avoid real estate lingo like “potential MIL suite”. Words like “wow” are a waste. Some input is for MLS members only, such as the information about you, the seller. After publication, demand to see your listing as another agent would see it and how potential buyers receive it from another agent. The presentation of your property on the Web, including a custom website and social media, should be part of a comprehensive marketing plan. When you present your home to sell you do not want to rely solely on the automatic syndication. It will only propagate the MLS-imposed limitations as mentioned above. Also, by importing data from the MLS into public websites, some facts about your home may be lost or misrepresented. When you present your home to sell, the manual input of your home’s facts and features into real estate portals ensures accuracy. It also makes for an expanded and richer presentation of your home and increases buyer appeal. Even in the age of the Internet printed information has its place. In many ways, it should confirm what the buyer and agent already know when they pay a visit to your home. There should be signs pointing to features easily missed (“Whole House Fan”) or confirm the listing (“Washer and Dryer go with Seller”). The flyer itself should be designed to be informative and serve as a reminder of what makes your home special. The listing sign traditionally serves as an advertising for the broker and agent. 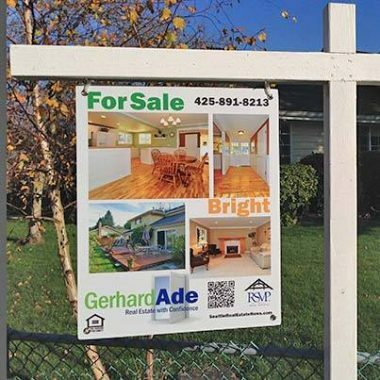 Why not use the sign to sell your Seattle home? That’s exactly what my signs do, and the sellers love it. To the extent possible, eliminate showing restrictions. That way you will not miss an out-of-town buyer only in for the afternoon. The lockbox is more than a security device. It lets your agent know when an agent has been to your home. Emails to visiting agents are not only polite but necessary to elicit feedback. Open houses should be announced everywhere your home is listed. Because I know more about your home than other agents, whenever possible I will host your open house. 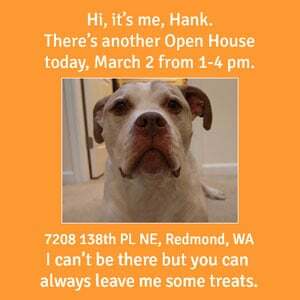 Social media is a great way to promote your open house. Published originally as the 39th issue of The View from the Street.